What if we could easily link our Open Badges to existing competency definitions? Vision: This would allow Open Badge portals and algorithms, that present Open badges, to calculate a weight of a badge, to visualize similarity and amendment of Open Badges and more. Badge issuers thus need an easy way to find the proper URLs to such competency definitions in order to use them in their badge AlignmentObject-fields. Additionally, URLs of skill and learning outcome definitions can be used in the criteria-field. Problem: Currently, most definitions of such competencies in frameworks are limited to text, human readable format (mostly PDF). Approach: Our project outcome O2A3 (first draft and prototype) for competency alignment proposes an approach towards the technical interoperability of OpenBadges with unambiguous definitions of competencies based on semantic web meta-data (using the JSON-LD or RDFa linked data format). The overall goal is to allow systems to detect similarity of defined badges and graph-based dependencies of the competencies linked to the OpenBadges. This could be achieved by using the unique IRI identifiers of JSON-LD defined competencies for the criteria and alignment fields in BadgeClasses (either directly or via an extension). Based on the desired functionalities from the community the major problems to address were identified. Beside the resolving of ambiguities (mentioned above) to allow earners and displayers to display similarity of badges, find badges that amend each other or contain others, such a solution will also assist issuers in defining badges. 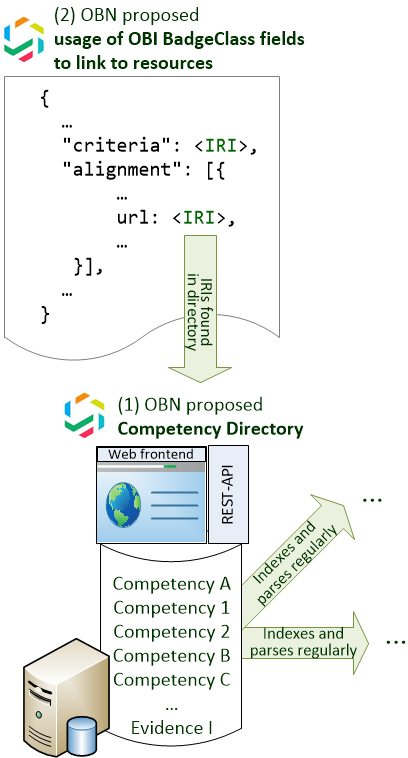 For this use case a directory is proposed that is filled by the community and allows searching, updating and traversal of the graph-like structure of defined competencies (and competency frameworks) to use the JSON-LD format export to be used in OpenBadge definitions. Finally, it can be stated that basically none of the manifold existing competency frameworks by now is available in a machine-readable semantic-web format (only ESCO has a XML download). Thus a strong recommendation exists to increase the effort in future projects that framework definitions must as well provide their results in a semantic format like RDF or JSON-LD. Based on this fact, the proposal suggests as well an end-user application as a third component. This application could assist in creating a JSON-LD conform format of existing competency frameworks that later on could be used in OpenBadges (and to be added to the directory). If you want to discuss, our next presentation and gathering is the MozFest in London 2016. OpenBadgeNetwork.com will be present in several sessions and discussions.